A study from bankrate.com reports that 59 percent of gift cards are now available electronically, up 18 percent from 2010. This is good news for millennials because they are "more likely to lose traditional plastic gift cards than older adults," bankrate.com says. The report says that 40 percent of 18- to 29-year-olds admit to losing a gift card and that mobile gift card usage among millennials is double that of older adults. "They are much harder to lose than traditional plastic cards," the report says. "There are lots of reasons why electronic gift cards appeal to customers," bankrate.com credit card analyst Jeanine Skowronski said. "For starters, they're a quick fix for anyone who needs a gift on the fly. Second, unlike their plastic counterparts, they don't take up excess real estate in your wallet. And though it may seem counterintuitive, a digital gift card can be easily personalized." Electronic gift cards can be accessed via email and smartphone apps. About 84 percent of Americans have received a gift card, and 72 percent have given one. Most of the cards are between $25 and $50. This is a popular trend for the consumer and technology savvy retailers around the world. But virtual and mobile gift cards are becoming very attractive to businesses offering incentives and rewards. The growth of technology based gift cards is in full swing for retailers, consumers, and now, the B2B marketplace. Although growing pains have arisen, the benefits of mobile and virtual gift cards are outweighing the risks. And, says NGC; they are here to stay for consumer convenience, as part of our mobile lifestyle experience. 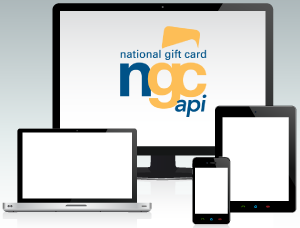 National Gift Card offers mobile friendly eCards as well as eGift cards in real time through its Gift Card API. Learn more today at giftcardapi.com.